Those who have followed us last year, have certainly recognized some changes. On the homepage of our shop are for examples some recent tweets shown that provides you with news from our company. But there is just a selection of information reported. The whole informationtail you can look up directly on our diffrent Twitter-Accounts. Here we collected our news for you in german and as well in english. If you don’t have a Twitter Account yet and don’t want to miss out on our news you can just read them easily as a RSS-Feed in your prefered Feed-Reader. For everyone who is on Facebook we have made some fanpages of our brands. Here you also get the necessary information about our company, our brands and even about individual products. Become a fan of our LSD-curtains for example and invite others to become a fan of us. When it’s about moved pictures you should check out our YouTube channels. Watch our latest product-videos and rate them. On our all in all four channles you can find more than 450 videos in total by now. And you can not only watch them but also integrate them in your own online shop, wesite or auction to inform your costumers as well about how a product works or looks like when it is in action. 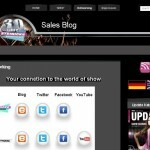 And of course we have our blog for you that will inform you about us and our products in every detail. But the most important with all those internet platforms is: They don’t only work one-sided but make it possible to participate in the things that are happening. Comment our blog-posts, rate our videos, answer our Tweets etc., because then we can all profit by them. The ones who aren’t that well versed in these modern instruments are also very welcomed at ours. We are pleased to stand by your side to explain you every detail as good as we can. If you tinker with the idea to use this platform for your comany too we would be pleased to share our experiences with you. You can approach us for that. We will also be at Prolight & Sound to inform you about this subject. The christmas contest by OMNITRONIC and EUROLITE enter the next round. Many interesting items were drawn last week already in our first contest and the winners have been notified. Who are the lucky ones, what they won and how it is in our raffle-series continues as usual, you learn on one of our YouTube channel. First of all it’s also worth again this week to participate. The new video for participation is already online. So turn on brains and participate. And don´t forget. Only if you have subscribed to one of these channels and sends in the solution of our riddle puzzle you can be a winner at least. Now it starts. Our unique X-mas lottery is now online. This time you have to watch a video we uploaded to our YouTube accounts of OMNITRONIC and EUROLITE. What you can win and how it works? Just watch the video! Our last Twitter contests finished and the winner has already received their prize from us. Congratulations once again. Of course, we will report the experiences of the winner about his OMNITRONIC MMC-1. After we and all the participants felt about this idea of a raffle in conjunction with Twitter as well, we have decided to start another sweepstake. This time, the profits will still be a little exuberant participate, so it is worth even more. But this time we will no longer be so easy to emerge victorious. The last game was simply a matter of retweet one tweet, which was set by ourselves. Of course that was easy. It will not be so easy this time. It is certain that another Twitter account will be necessary. But you should look, if you have already saved our YouTube channel in your bookmarks. Because so much was mentioned here before: it will go, among other things, at one of our videos stored there. You will then see an oddly dressed man, and it will be resolved in any equation. Whichever style, but the exact procedure, we will announce here and on all of us kept platforms like Twitter, Facebook, News on Steinigke.de etc. more precisely. Check us regularly and you can be one of the first players there. Here is a brief overview where you can read about us.